of other parts of the world. South America had its own families of marsupials, some of which mimicked dogs, bears, sabre-toothed cats and others in an uncanny way. The herbivores for most of the Cenozoic were rodents, some as large as deer, or larger (see p. 358), native South American ungulates, including horse-mimics and rhinoceros-mimics, and the armadillos and sloths (edentates). Where did these remarkable mammals come from and what has happened to them now? North America about 70 Myr ago when mammals were able to cross both ways. Mesozoic mammals from Argentina include Vincelestes from the Early Cretaceous (see p. 308) and a diverse mammalian assemblage in the Los Alamitos Formation of Patagonia, the latter associated with hadrosaur and titanosaurid dinosaurs and crocodil-ians. This fauna (Bonaparte, 1994) includes two tricon-odonts, a symmetrodont, ten dryolestoids and the gonwanatheriids, known only from southern continents. A fauna from Laguna Umayo in Peru, probably of latest Cretaceous age, includes the didelphid marsupial Alphadon, a pediomyid marsupial and a condylarth, in association with dinosaur egg shells. After the KT event, the basal mammalian groups and many of the marsupials disappeared elsewhere in the world. But South America was now an island again and the marsupials and placentals evolved there in isolation. An early Palaeocene fauna from Tiupampa, Bolivia, includes 11 marsupials, mostly showing similarities to later uniquely South American groups (Muizon and Cifelli, 2000, 2001), as well as representatives of several placental groups, most of them showing relationships to North American forms (cimolestans, mioclaenids, pantodonts), but some (notoungulates) unique to South America. Marsupials radiated in South America to a lesser extent than they did in Australia, but they dominated as insectivores and included major carnivore groups and some small herbivores. The 15 families of extinct insectivorous and carnivorous marsupials show striking conver gences with placental shrews, cats, sabre-tooths and dogs. The South American marsupials, the Ameridel-phia, include three clades. 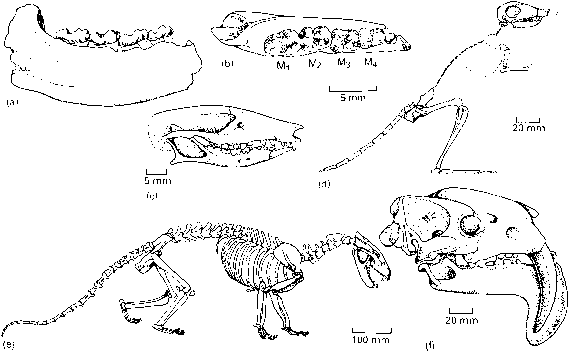 The Didelphimorphia, essentially the opossums, are well known from the Upper Cretaceous in North America (e.g. Alphadon; Figure 10.13(c-e)) and the Palaeocene of South America (Muizon and Cifelli, 2001). Didelphids survived through the Cenozoic in South America, although they died out in North America in the Miocene. They re-entered North America at the time of the Great American Interchange (see p.320). Palaeothentes from the late Oligocene and early Miocene, were also small insectivores or omnivores with an elongate lower incisor and blade-like cheek teeth (Figure 10.18(c)). The family survives today: Caenolestes is a small shrew-like animal that lives in the higher Andes. The kangaroo rat lookalike Argyrolagus (Figure 10.18(d)) has a narrow snout and broad cheek teeth for crushing tough plant food. The hindlimbs are long and powerful, which suggests a hopping mode of locomotion. The third clade, the Sparassodonta, consists of two groups of larger animals, both carnivorous. The borhyaenids, known from the Palaeocene (Muizon et al., 1997) to the Pliocene, such as Prothylacynus (Figure 10.18(e)), have short limbs and rather dog-like skulls. Their later relatives, the late Miocene and Pliocene thylacosmilids, have skulls (Figure 10.18(f)) that are almost indistinguishable from those of the sabre-toothed (placental) cats that lived in North America at the same time. 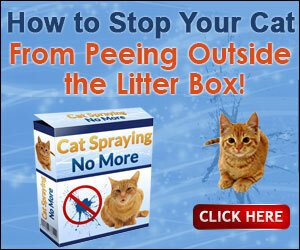 The upper canine tooth is very long and it grew continuously, unlike the canine of true cats. It was presumably used for puncturing the thickened hides of the large thick-skinned South American notoungulates (see pp. 319-21). Some of the most characteristic mammals of South America are the Xenarthra, which include the armadillos, tree sloths and ant-eaters (Rose and Emry, 1993). This group has had a spectacular history, which is not evident from the living forms (Simpson, 1980). The name Xenarthra (literally 'extraneous joints') refers to supplementary articulations that are present in all forms between some of the trunk and tail vertebrae (Figure 10.19(h)). In addition, they have a peculiar arrangement in the hip girdle in which the ischium, as well as the ilium, is fused to the anterior caudal vertebrae (Figure 10.19(c)). Thirdly, the teeth are much reduced: xenarthrans have few or no incisors and the ant-eaters have no teeth at all. 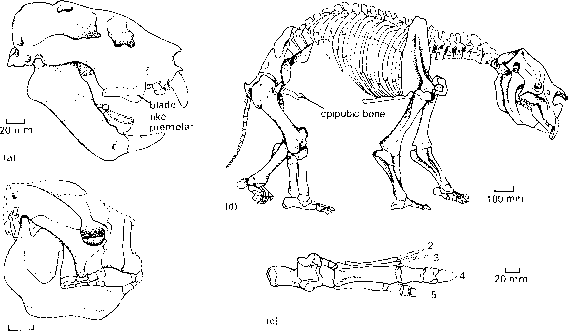 The Xenarthra used to be classified with the pangolins (Pholidota), but the latter group now appears to be allied with the Carnivora (see p. 353). The armadillos (Dasypodidae) first appear in the fossil record in the late Palaeocene, but the remains are only armour scutes. They radiated in the Oligocene and Miocene when a variety of small and large forms appeared. Like the modern Dasypus (Figure 10.19(a)), they all have a bony shield over their heads, a body armour that is partly fixed and partly formed of movable rings and a bony tube over the tail. 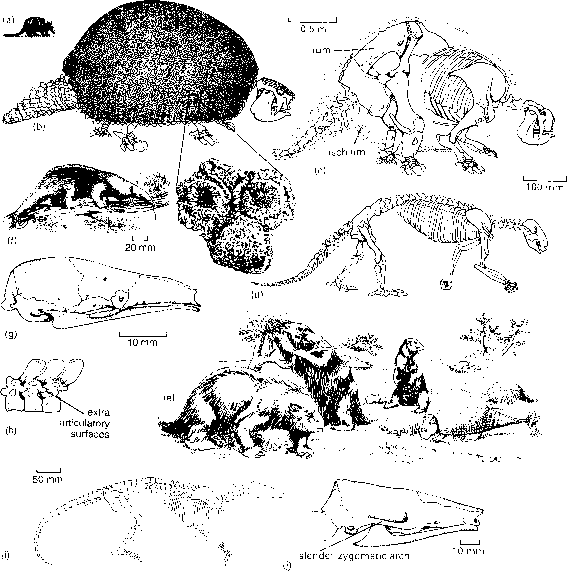 The most spectacular relatives of the armadillos were the glyptodonts (Figure 10.19(b, c)), which reached very large sizes in the Pliocene and Pleistocene (Gillette and Ray, 1981). The heavy armour, weighing as much as 400 kg in a 2-tonne animal, is clearly proof against voracious predators such as the sabre-toothed marsupials (see p. 316). The skull is short and deep (Figure 10.19(c)) and the massive jaws accommodate long, continuously growing cheek teeth that were used to grind up abrasive grasses. The short tail is flexible and in some forms bears a spiked club (Figure 10.19(e)) that was probably used to whack sabre-tooths. In calculating the energy of the blow, Alexander et al. (1999) found that a large Glyptodon with a 40-kg tail club could move the tip at up to 12 ms-1, using some 3000 joules of energy. This is equivalent to the speed achieved by a shot-putter hurling the metal shot, and the power of the blow was sufficient to shatter glyptodont armour in intraspecific fights. The sloths date back to the Oligocene and they had a broad radiation, even though only five species of tree sloths survive today. A Miocene sloth Hapalops (Figure 10.19(d)) is a small semi-arboreal animal that has only four or five cheek teeth in the jaws. Sloth evolution followed two main ecological lines from the Miocene onwards. Some remained small and became adapted to life in the trees, like the modern tree sloths (Bradypodidae, some Megalonychidae), and the ground sloths (Megatheridae, Mylodontidae, some Megalonychidae) achieved giant size.